Father Comes Home From the Wars is an explosively powerful drama about the mess of war, the cost of freedom, and the heartbreak of love, with all three parts seen in one night. 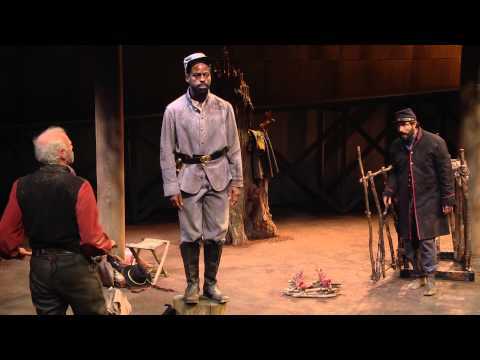 Pulitzer Prize and Tony Award-winner Suzan-Lori Parks delivers the stunning first installment of a new American Odyssey, set over the course of the Civil War. Offered his freedom if he joins his master in the ranks of the Confederacy, Hero, a slave, must choose whether to leave the woman and people he loves for what may be yet another empty promise. As his decision brings him face-to-face with a nation at war with itself, the loved ones Hero left behind debate whether to escape or wait for his return…only to discover that for Hero, free will may have come at a great spiritual cost. Father Comes Home From the Wars is an explosively powerful drama about the mess of war, the cost of freedom, and the heartbreak of love, with all three parts seen in one night. Part 1 introduces us to Hero. In Part 2, a band of rebel soldiers test Hero’s loyalty as the cannons approach. Part 3 finds Hero’s loved ones anxiously awaiting his return. A devastatingly beautiful dramatic work filled with music, wit, and great lyricism, Father Comes Home From the Wars is an epic tale about holding on to who we are and what we love in a country that both brings us together and rips us apart. Setting: Part 1: Early Spring 1862. A slave cabin in the middle of nowhere. Far West Texas. One hour before dawn. Part 2: Late Summer 1862. A wooded area in the South. Pretty much in the middle of nowhere. Part 3: Fall 1863. Far-West Texas. A slave cabin in the middle of nowhere. 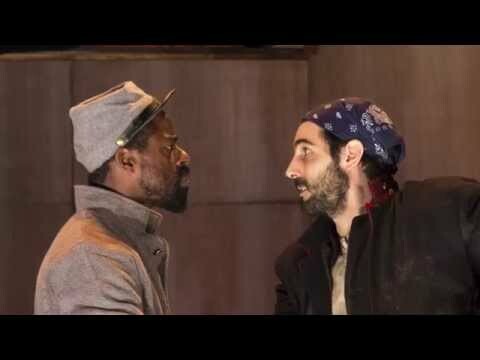 Father Comes Home From The Wars (Parts 1, 2, & 3) was developed at the Public Theater Lab in 2009, and the play received its premiere production in 2014 at The Public Theater, under the direction of Jo Bonney.